Like other technologies that couldn’t keep up with the times, controls that only flashed a light to warn an operator of a stopped stamping press have long outlived their usefulness. As manufacturers have expanded their expectations for press controls, the technology has evolved, and will continue to evolve. Today, offers Phillips, one-button operation is the ideal. Suppose a metalformer wants to reduce changeover time to 5 min. Of course that means investing in die-change components for the task. But, says Phillips, it also means ensuring that the controls can make it happen. Unlike in years past, with today’s press controls, an operator needs only to enter a job number and all press functions are updated—shut height, counterbalance, press speed, die protection, feed length, lubrication sprayers, etc.—and adjusted to their proper settings. Look for continued evolution—it’s happening even now—with the press control overseeing setting and monitoring performance across an entire workcell. As thinking evolves from stamping as an assembly-line process to cellular manufacturing, controls will enable the evolution. “The integration of ancillary devices into a single-button operation so that all systems are communicating—that’s where controls are heading,” Phillips says. “Enter a job number and all press functions are updated—shut height, counterbalance, press speed, die protection, feed length, lubrication sprayers —all adjust to their proper settings. The same occurs with transfer systems, robots and other cell operations such as assembly and material handling.” Metalformers want a more complete part coming off of the press, driving controls to adapt to the increased use of cellular manufacturing, and to communicate more closely with the entire cell. Metalformers and their customers increasingly crave information, for a variety of reasons, and controls have developed capabilities to gather and share it. 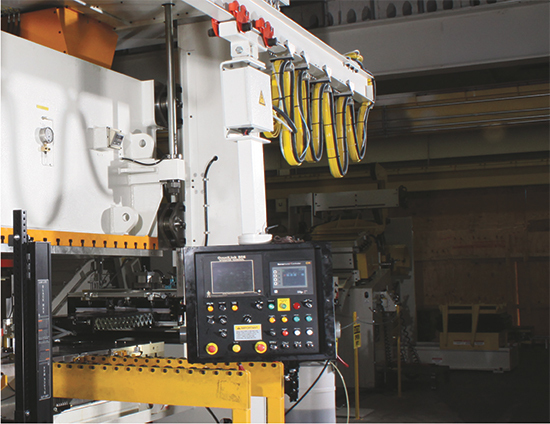 Press controls increasingly offer diagnostic capabilities, eliminating downtime related to a technician having to inspect the press line in detail. 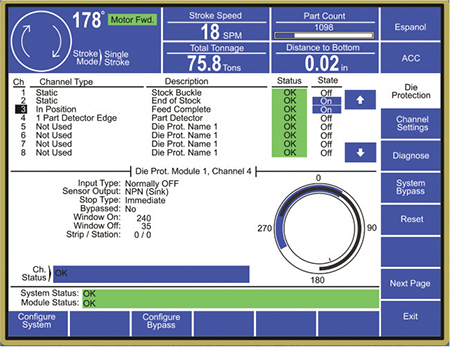 Simple, yet detailed control displays provide critical press-line information to the operator, and feed into company-wide systems that assist in scheduling and performance assessment. Die protection is a critical function routinely handled by today’s press controls. “Controls can provide real-time information on job status and when a job will complete, allowing metalformers to have fork trucks rolling to position the next die or change part bins,” Phillips says. “Controls also integrate with MRP and ERP systems (providing offline updates) to improve, for instance, the tracking and ordering of materials. 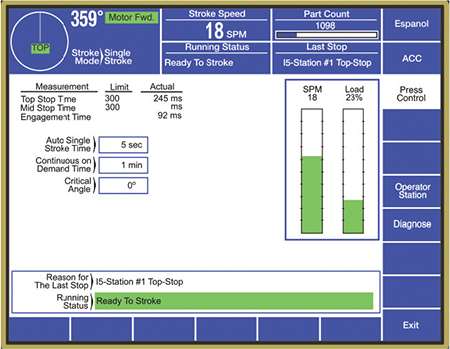 To inform software systems and networks, and aid company decisionmakers, press controls gather and relay information to monitor tool wear and equipment performance, and plan maintenance. In more complicated situations, according to Phillips, technicians require diagnostic tools in the control that show input and output status, with less daisy-chaining, an architecture that increases troubleshooting time. In addition, due to arc-flash regulations and electrical-shock hazards, technicians can examine inputs and outputs shown on the control screen instead of entering a hot electrical panel. Beyond that, controls today provide an abundance of historical data used to create baselines and chart performance for a variety of uses. The trend points toward manufacturers seeking data gathering and automatic reporting to the point that some actuating mechanism on the press or in the cell will do something with that information, according to Phillips. 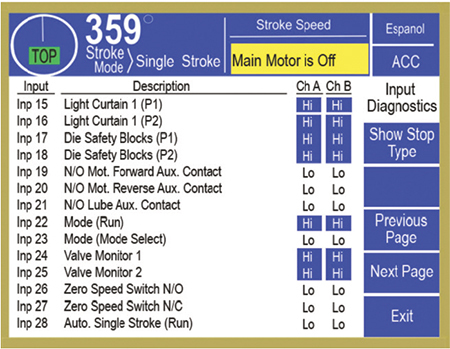 Also, because control systems no longer are expected to just monitor and report on the press but on ancillary systems as well, more diagnostic trouble codes are needed, and efforts are underway to add sensoring and provide more codes. More and more, press controls assist in error-proofing. Driven in large part by automotive poka-yoke systems, manufacturers not only want to verify good parts, they want automated systems to provide those reports. Press controls can assess coil entering the press and, via servo and stepper motors, automatically adjust wedges in the die to account for occurrences of thicker material. 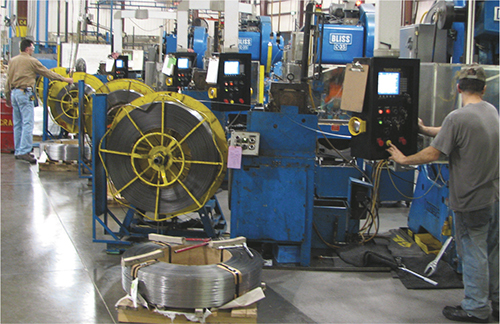 This capability assists as metalformers increasingly specify tapered coil, where thickness is varied intentionally on certain areas of the strip, reports Phillips. Automotive trends toward weight reduction and vehicle safety make it more economical when producing in high part volume to move away from secondary welding of stiffening material to increase rigidity. With more customized material finding its way to the shopfloor, more will be demanded of press cells and their controls. Automotive, aerospace, appliance and other sectors demand that their suppliers meet higher standards.